This is the first of many interviews talking with the people who garden and who are involved with the Sustainable Renton Community Farm. They are such an amazing group of people that I thought it would be great to get to know them a bit better. The first gardener I am featuring is Liz Kramps. 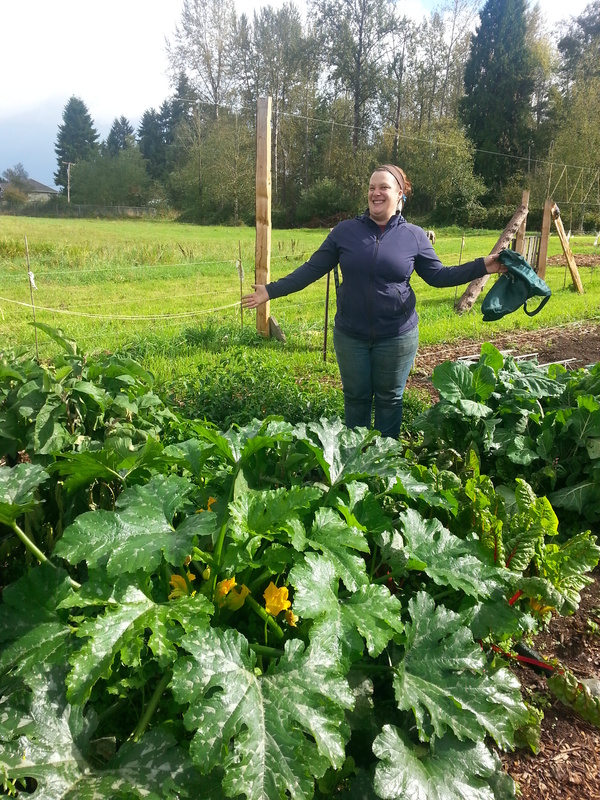 She came to farm in July and has managed to make her plot so abundant, that she has been able to contribute to the harvests that go to The Red House twice a week. She has an amazingly mellow and confident demeanor that makes her very easy to talk with and when you do, you find out that she is a wealth of knowledge on various topics of gardening. She has provided the farm and other gardeners with excellent resources and information. Currently I’m working for a clinical research organization. Not my ideal job, would much rather do something with a bit more soul, but it pays the bills for now. I’ve been gardening for about 10 years to varying degrees. I started with tomatoes and peppers on my fire escape, to a barrage of containers in a neighbor’s yard, to a community garden plot. Most of my experience has been on the east coast so there’s been a little learning curve since I moved to WA 2 and a half years ago. I am enjoying the mild winters and am really excited to grow this winter. I was looking for a space to grow things and in my search found the SRCF. I was so excited to find such a great space so close to home!! What do you like most about the SRCF? I really like that it’s a new space with so much potential and a great mix in it’s knowledge base. Right now I have a LOT of greens, some peppers, eggplant, tomatillos and summer squash. The one thing that I grow every year are thai hot peppers, though I’ve found the PNW a little tricky to grow hot peppers in. I’m thinking of keeping them in a small hoop house all summer next year and/or keeping black plastic over the soil to keep the temps up. I am most excited to expand my garden and include brassicas and garlic. I don’t have a specific philosophy, obviously I employ organic principles. Beyond that I grow food because I want to know what it is that I am eating. Over the years I have transitioned to eating probably 85% local and in season, my weaknesses being coffee, sugar and bananas :). I preserve quite a bit, have a well stocked chest freezer and participate in countless bulk buys to procure food that is locally produced from small farmers. Overall I know who grows or raises most of my food. I currently have a small flock of laying hens and have in the past raised meat chickens, which is something I’d like to be able to do again next year. This year I am raising turkeys for my sister and I for the holidays and have learned that turkeys are super funny and am dreading their impending end. Though I guess my ‘eating philosophy’ is that if I want to eat it, I should be able to grow/raise it and do all the steps from farm to table. Previous Previous post: Winter Gardening Workshop-This Monday!